One very distinctive effect in guitar playing is the bend. Below are some notes to bend in your Pentatonic scale. There are three notes here: C, D and G to bend. The main notes are the D and G. The D bends to makes the E or the 5th in the scale, the G bends to make the A. Practise by bending the note up until it sounds exactly the same as the note you want, play it first. The C is different as it does not want to be bent to C#, semitone or half-step, it just wants to move a quarter-step. This bend will sound good dropping to the A after the bend; you should recognise it and how far to bend the note. These bends are similar to the first, except you play a note while bending another note at the same time. In the first example the E is fretted by the first finger, the D with the 3rd, as you bend the E you hear the D bend up until it meets the same note. This is good practise for the single bend. The second example is similar, but the third and fourth fingers are used. The last example can be easier bent down or towards you. Try resolving this bend to the A on the 4th string. The first two examples have two notes held down while you bend the third and they have a nice full sound. 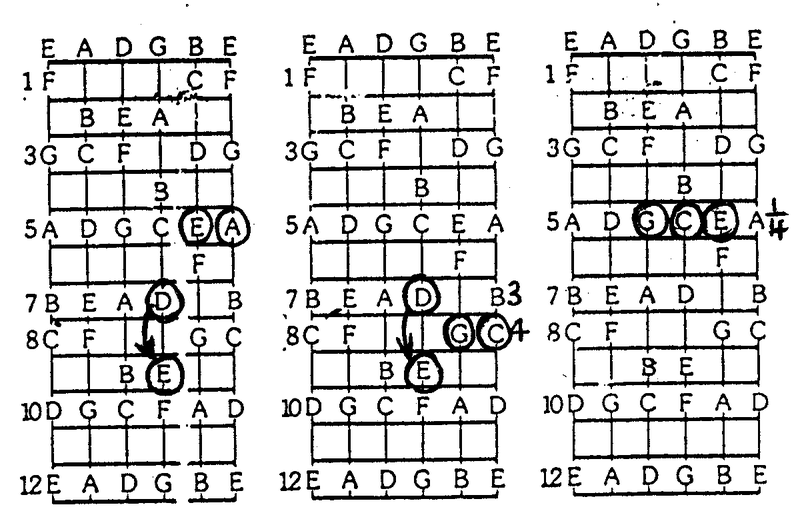 The third example is a C chord bent up a quarter step, the same as you did on the C note. This is not difficult, but easier with lighter gauge strings.